Are you a fan of sports, trips into the woods, or hiking? The 2019 Ford Explorer can take you anywhere. It’s large, reliable, and loaded with power. Since the Ford Explorer was introduced in the ’90s, it has been considered one of the best SUVs on the market and today it continues to show why. 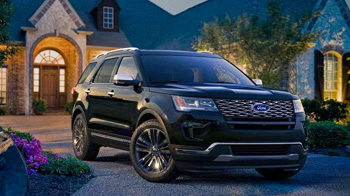 Performance-hungry drivers will be happy to know that the popular Ford Explorer Sport returns with a still satisfying 365 horsepower and 350 lb-ft of torque, combined with a sport-tuned front and rear suspension that makes for tight handling and improved stability around corners. By using two smaller turbochargers as opposed to one larger one, the Explorer Sport delivers instantaneous throttle response, virtually eliminating turbo lag. It gives you V8-like performance with the fuel economy of a V6. Want to learn more? 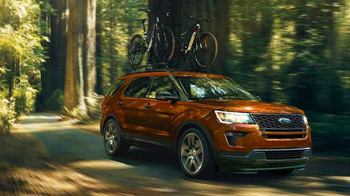 Check out our online showroom for specs, pricing, photos, and other information on Ford Explorer models. Our Port Coquitlam Ford dealership has a large inventory to choose from, and we’re just a short drive from Port Moody, Maple Ridge, Pitt Meadows, and Burnaby, British Columbia. Visit us today and take a test drive! When it comes to power, you can rely on the Explorer. The Explorer’s 3.5L Ti-VCT V6 engine returns with 290 horsepower and 255 lb-ft of torque but without sacrificing fuel economy (13.9L/100km City and 9.8L/100km Highway). Back for 2019 is the highly potent—standard 2.3L Ecoboost engine, which is a four-cylinder that punches well above its weight class with 280 horsepower and 310 lb-ft of torque. Even better, this pint-sized powerhouse can be paired with AWD and still eke out 13.1L/100km City and 9.1L/100km Highway. The Explorer offers up to seven-passenger seating so you can take your whole family with you. The third row can be used for storage and the seats fold down at the click of a button. You speak, Ford listens. 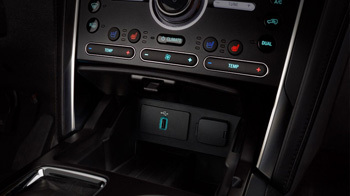 The 2018 Ford Explorer comes equipped with voice-activated SYNC technology that gives you hands-free control of many vehicle functions including your mobile devices. Voice activated navigation integrates with SYNC to let you focus on the road while getting accurate directions to your destination. And if you insist on the absolute best, the “Platinum” trim pushes luxury and comfort to a whole new level. Style never stops evolving, so neither does the Ford Explorer. LED headlights and a square front-end mark the Explorer’s sophisticated look. The Explorer reaches new levels of aggressive refinement when paired with the available 20-inch aluminum wheels. But this SUV isn’t all style and no substance. Smart features like a power liftgate make loading cargo easy. It can be lifted or closed by pushing the vehicle key fob, pressing a button on the instrument panel in the cabin, or using the button on the bottom of the tailgate. Users can program the extension height of the liftgate, which is highly useful if the truck is parked in a space with a low ceiling. In government crash tests the Explorer received five out of five stars for overall crash protection. And its no wonder the Explorer is so safe, with technology like Curve Control which improves handling and safety around corners, while standard AdvanceTrac® with Roll Stability Control delivers enhanced control for your turns, reducing your risk of rolling over. 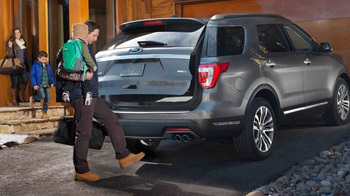 If looking good just isn’t good enough, then you’ll want to check out our great selection of Ford Explorer accessories to give your SUV that little bit extra. We have what you need to customize your Explorer with aftermarket parts as well as genuine Ford OEM parts for repair or maintenance. Give us a call or order your parts online and drop by our parts department today.